1. Do Your Research. Before embarking on such a significant restoration project, a crucial first step is to ensure every aspect of workflow has been planned in advance. Will the scanning and restoration be completed in-house? If so, what kit will be needed? For the team at Goldcrest, ultimately the decision was made to complete the entire restoration in-house as part of Goldcrest's digital intermediate workflow. "We had all the infrastructure and personnel required to do it, but as with any restoration, we knew the project would entail numerous challenges," explains chief technology officer, Laurent Treherne. To handle these challenges, a dedicated DaVinci Resolve workstation was set up alongside the Blackmagic Cintel Film Scanner in order to create a standalone, single workstation pipeline that would not impact on Goldcrest's DI work. 2. Locate Suitable Sources. The next step was to find references to best decide how each film would ultimately look when scanned in digitally. "In most cases, we had an SD digi beta reference tape of each film available from a previous telecine transfer, although these versions were often different cuts to the remastered versions," says head of production, Rob Farris. "Occasionally we were able to source a DVD or BluRay. These reference tapes would act as an initial guide and then further refinements would be applied to make the best use of the additional quality and detail available in the new scans." 3. Physically clean up prior to scanning. Film, especially if older or not stored in the right conditions, will deteriorate over time, resulting in problems ranging from minor artifacts down to splices that have been stuck together in such a way as to result in noticeable physical jumps at a scanner gate. To handle this, the Goldcrest team next ensured film elements were inspected and cleaned in laboratory conditions before each reel was then scanned in 4K on to a dedicated high speed storage volume and conformed and reframed to 2K. "We made use of PF Clean for the majority of the dust-busting work," Farris continues. Something as simple as removing all the dust from a film reel will significantly reduce the amount of artifacts present in a final scan. Other techniques to improve the quality of a final scan included repairing all film tears with tape or splicing tools. 4. Digital clean up after scanning. Supplementing physical repairs and dust busting, digital clean up is needed to fix any other artifacts that haven't already been dealt with through physical clean up. As the Cintel film scanner they were using fed directly into DaVinci Resolve Studio, the Goldcrest team reveals they used Resolve to handle everything digital from grain reduction to the removal of tiny artifacts unable to be fixed through physical clean up. "All of the restoration resources were seamlessly and judiciously applied via a solid team effort from the colourist, editorial support and our Digital Film Bureau," explains managing director Patrick Malone. 5. Create a Grade. The next step in the restoration process was to continue to work in Resolve to give scanned footage a grade. "The main aim was to evoke the look and feel of the original masters whilst subtly improving them via grade finesses in order to present the remastered films in the best light," Malone continues. "Obviously the Resolve colour correction tools were most commonly used in the process. Match-grading a project to a reference tape is substantially different to grading digital source material with a creative in attendance, but in terms of using the broad range of grading tools the processes are fundamentally the same." 6. Re-version picture and sound files. 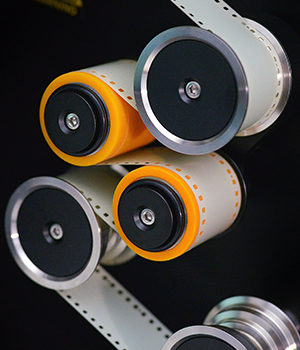 Once the films have been properly scanned in, digitized, and all post production has been completed, they need to be delivered into formats suitable for the modern consumer. "We deliver in HD ProRes HQ 422, as that's the delivery requirement for multi title library distribution deals, however Ultra HD 4K is increasingly a consideration for clients, so it's an important requisite, certainly for future sales strategies," tells Laurent. 7. Store well! Last but not least, the last step for anyone who has restored a film is to store the original reel in a cool, dry place to ensure it is preserved for as long as possible for the future, just in case.